The predator expert who came out to look at my dead calf told me it was a coyote kill, not a wolf. He showed me the bare leg bones and the ribs, not ripped apart or crushed. I commented in my sermon that had I been in a similar situation, I probably would have let the lion have just that one lamb. I realize now that I may have been wrong in that self-assessment. I do not claim a sudden extraordinary bravery, but I spoke at that time more as a disinterested observer. With the death of my calf, I have come to understand that David acted with the heart of a shepherd. My little calf Corabelle had been a long-awaited calf. Not only did we wait so long for her to be born this year, but I have been waiting for three years. I bought her mother Cora three years ago when I started buying cows for my herd. Cora was already old when I bought her, but she was such a nice animal, and although no longer possessing the body of a youthful cow, she had a regal air about her. As she walks, she holds her head up high, as if she were an age-ed queen, walking before her subjects. In the three years that I have had her, Cora has given birth to three calves. Every year I hoped for a heifer, but for two years she had given me bulls. Royalty in human institutions have historically wanted boy children to carry on the royal line, but I wanted a girl. I wanted a heifer to carry on Cora’s line. This year she finally arrived – less than one week ago. Vivian named her Corabelle. This morning as I walked out to see my cows, Corabelle was not with her mother. This is not altogether unusual, since the mother cows sometimes leave their calves sleeping while they graze. But that was not all that I noticed. Cora’s udder was very full and it looked like her calf had not nursed for some time. I became worried. I went down into the woods that comprises part of the pasture where the cows had been, inwardly knowing what I would find. Somehow, I walked right to the site without searching around. 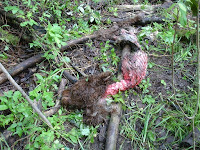 There on the ground was the head of my Corabelle, with the bloody spine and leg bones attached. Everything else was gone. Suddenly, I realized another dimension to having a shepherd’s heart, or in this case, a herdsman’s heart. My thoughts were not on financial loss, they were not how this impacted my plans. Much to my astonishment at my own actions, I just began wailing for this little life that had been lost. “My little Corabelle!” I cried over and over again. I know that this is true. I am not trying to compare the two. I only wish to say that this incident taught me something about a shepherd’s heart. When I was a boy, growing up on the farm, an unexpected or tragic death of an animal was something that happened from time to time. That is the reality of farming. This has always made me a bit sad, but never do I remember being as painful of heart as I did with the death of my calf this morning. It brought something out in me that I did not even know about myself. It also helped me to understand how David could grab a lion by the beard and smite him until he died. There was no calculation on the part of David in doing this, no weighing the consequences. David was responsible for the sheep, and he would protect them and save them. One winter day many years ago, when two of our sons were very small, Vivian came out to the woods where I was logging to see me. She was pulling a sled with the two boys in it, one of them about two years old, and the other only six months. Suddenly, she came upon a wolf, standing off to the side of the logging road. The wolf looked at her, and she at the wolf. Both Vivian and the wolf stared into the eyes of the other for a tense moment or two. Finally, the wolf put his head down, turned around and trotted off into the forest. I believe she would have. Apparently, so did the wolf. This is the heart of a mother, not a shepherd or a herdsman, but the need to protect those for whom you are responsible draws its energy from the same source. That is why, when there is a loss, the heartbreak is so severe. As I said, exponentially more severe is the loss of a child, but even with my calf, I was astounded to feel such grief. What I understand better today than I did yesterday is that we have no idea the lengths to which Jesus will go to save us. Indeed, he did lay down his life to save us, but in a certain way, that same protective heart of the shepherd continues to go to any lengths to bring us to safety. He loves us more than we can ever comprehend. Another thing that I understand better today than I did yesterday is that we also have no idea the grief that Jesus feels when one of us is lost, snatched up in the jaws of Satan. 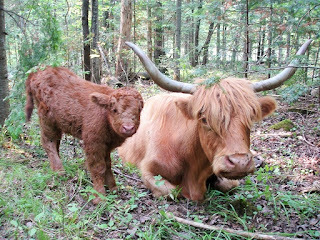 I was astonished at myself, how I wailed almost uncontrollably for this little lost calf. I cannot imagine the pain of our good shepherd when one of his is lost.